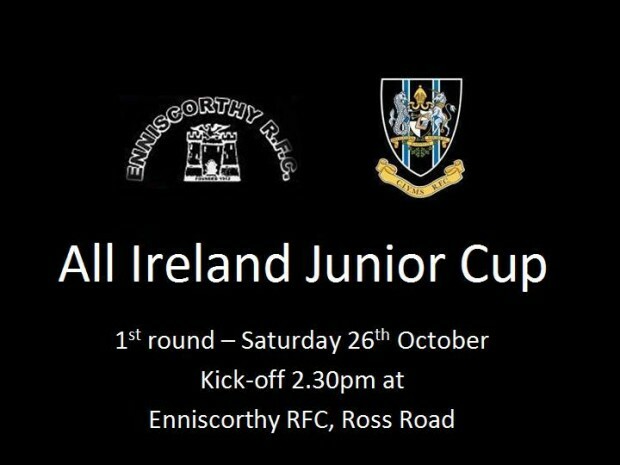 Saturday sees CIYMS first appearence in the All Ireland Junior Cup. The competition features the top 4 sides from each of the four provinces in a knockout format. CIYMS travel to Co. Wexford to face last year’s cup runners up Enniscorthy RFC. Both teams have long and proud histories in Irish club rugby and good support is anticipated. CIYMS: CI finished in 2nd place last year behind Portadown to qualify for the cup. This year, CI sit 4th in Qualifying 1 with four wins from 5 games and having played a game less than two team aboves them. Enniscorthy: Founded just over a century ago in 1912, Enniscorthy have good pedigree in the cup having finished runners up in last year’s final against Tullamore who went on to be promoted to the AIL. This year, Enniscorthy sit 7th in the difficult Leinster 1A league with one win from four.